A global paleogeographic reconstruction of the Earth in the later Triassic, 220 million years ago. Gondwana, formerly called Gondwanaland, was a southern supercontinent. It formed when Pangaea broke up, starting 180 million years ago (mya), in the early middle Jurassic. The Pangaean global supercontinent was complete 250 million years ago. Then it split into two smaller supercontinents, which were about the same size. The northern part of Pangaea became Laurasia, and the southern part became Gondwana. 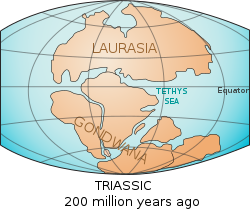 Over time, Gondwana drifted south, while Laurasia moved north. Gondwana included most of the landmasses in today's southern hemisphere, including Antarctica, South America, Africa, Madagascar, Australia–New Guinea, and New Zealand. It also included Arabia and the Indian subcontinent, which have now moved entirely into the Northern Hemisphere. Gondwana itself began to break up in the mid-Jurassic period, about 170 million years ago. Nothofagus is a plant genus that shows a Gondwanan distribution. It first appeared in Gondwana and still exists in parts of Australia, New Zealand, New Caledonia and Chile. Fossils have also recently been found in Antarctica. The adjective Gondwanan is often used in biogeography to describe where different organisms live. It is most commonly used when the organisms only live in two or more of the now-separate regions that were once part of Gondwana, including the Antarctic flora. For example, the Proteaceae, a family of plants, lives only in southern South America, South Africa, and Australia. This is called a "Gondwanan distribution" (meaning that the Proteaceae live only in the areas that used to be part of Gondwana). This pattern shows that the Proteaceae have existed for a very long time – since the time that Gondwana existed. Evidence of plant and animal distribution supported the ideas of two scientists: Alfred Russel Wallace and Alfred Wegener. Wallace explained geographical distribution as the result of evolution. Wegener used geographical distribution as evidence for continental drift. Between 160 and 23 million years ago, Gondwana broke up. Africa separated from Antarctica around 160 million years ago. Next, it separated from the Indian subcontinent, in the early Cretaceous period (about 125 million years ago). About 65 million years ago, Antarctica (then connected to Australia) still had a tropical to subtropical climate, with marsupial fauna. About 40 million years ago, Australia-New Guinea separated from Antarctica. This allowed latitudinal currents to separate Antarctica from Australia, and the first ice began to appear in Antarctica. During the Eocene-Oligocene extinction event about 34 million years ago, levels of carbon dioxide were about 760 parts per million. They had been decreasing from earlier levels, which were in the thousands of parts per million. Around 23 million years ago, the Drake Passage opened between Antarctica and South America, resulting in the Antarctic Circumpolar Current that completely isolated Antarctica. Models of the changes suggest that decreasing levels of carbon dioxide became more important. The ice began to spread through Antarctica, replacing the forests that had covered the continent. Since about 15 million years ago, Antarctica has been mostly covered with ice. Around six million years ago, the Antarctic ice cap reached the size it is today. There are several submerged (underwater) lands in the Indian Ocean, off the west of Australia. They are under more than 1.5 kilometres (0.93 miles) of water. Their rocks show that they used to be part of Gondwana. They are not the type of rocks that are usually found in the ocean, like basalt. Instead, they are typical land rocks, like granite, sandstone, and gneiss. They also have the type of fossils that are now found on continental areas. Recently, two of these sunken islands were found to the west of Perth, Western Australia. These islands are almost the size of Tasmania, and have flat tops. This shows they were once at sea level before being submerged underwater. It also shows that when India began to break away from Australasia in the early Cretaceous period, the islands formed part of the last link between the two present-day continents. The Naturaliste Plateau is a submerged land off of Western Australia. It has an area of 90,000 square kilometres (34,749 square miles). The Naturaliste Plateau may have deposits of oil. When it was above land during the Mesozoic era, it had a tropical climate which might have been perfect for creating coal, oil and natural gas. The Kerguelen Plateau is a submerged microcontinent in the southern Indian Ocean. It is about 3,000 kilometres (1,900 miles) to the southwest of Australia, and extends for more than 2,200 kilometres (1,400 miles) in a northwest-southeast direction. It is under deep water, but a small part of the plateau is above sea level, forming the Australian Heard Island and McDonald Islands, and the French Kerguelen Islands. The islands are part of a large igneous province (LIP) which started when Gondwana started to break up, 130 million years ago in the Lower Cretaceous period. Volcanic activity occurs sometimes on the Heard and McDonald islands. ↑ "Gondwana". Dictionary.com. Lexico Publishing Group. Retrieved 2010-01-18. ↑ "Gondwanaland". Merriam-Webster Online Dictionary. Retrieved 2010-01-18. ↑ Buchan, Craig (2004). "Paper #207-8 - Linking subduction initiation, accretionary orogenesis and Supercontinent assembly" in 2004 Denver Annual Meeting. Geological Society of America. ↑ Houseman, Greg. "Dispersal of Gondwanaland". University of Leeds. Retrieved 21 Oct 2008. ↑ H.M. Li and Z.K. Zhou 2007. Fossil nothofagaceous leaves from the Eocene of western Antarctica and their bearing on the origin, dispersal and systematics of Nothofagus. Science in China. 50: 1525-1535. ↑ "New CO2 data helps unlock the secrets of Antarctic formation". Physorg.com. Retrieved 2011-07-26. ↑ DeConto1, Robert M.; Pollard, David (2003). "Rapid Cenozoic glaciation of Antarctica induced by declining atmospheric CO2". Nature 421 (6920): 245–9. doi:10.1038/nature01290. PMID 12529638. http://www.nature.com/nature/journal/v421/n6920/abs/nature01290.html. Retrieved 19 October 2009. ↑ Trewby, Mary, ed. (2002). Antarctica: an encyclopedia from Abbott ice shelf to zooplankton. Firefly Books. ISBN 1-55297-590-8. This page was last changed on 2 January 2019, at 18:59.